춘양중학교 안에 동·서로 마주 서있는 2기의 탑으로 쌍탑형식을 띤다. 이 곳은 신라의 옛 사찰인 남화사(南華寺)의 옛터로 알려져 있는데, 신라 문무왕 16년(675)에 원효대사가 여기서 서북쪽으로 6㎞ 정도 떨어진 곳에 현재의 각화사를 창건하면서 이 절은 폐사되었다고 한다. 탑은 2단의 기단(基壇)위에 3층의 탑신(塔身)을 올린 모습으로 두 탑 모두 같은 양식이다. 기단은 아래·위층 모두 4면의 모서리와 가운데에 기둥 모양의 조각을 두었다. 탑신은 몸돌과 지붕돌이 각각 한 돌로 이루어져 있으며, 위층으로 갈수록 규모가 줄어들어 뚜렷한 체감률을 보인다. 각 층의 몸돌에는 모서리마다 기둥 모양을 새겨 두었다. 그리 두껍지 않은 지붕돌은 밑면에 4단씩의 받침을 두었으며, 네 귀퉁이에서 살짝 들려 있다. 꼭대기의 머리장식은 서쪽 탑에만 네모난 노반(露盤:머리장식받침)이 남아있을 뿐이며, 동쪽 탑은 모두 없어졌다. 기단부가 땅 속에 파묻혀 있고 탑이 몹시 기울어져 있어 1962년 10월에 해체 ·복원하였는데, 이 때 서탑에서는 사리함을 넣었던 공간이 발견되었고 동탑에서는 사리병과 함께 99개의 작은 토탑(土塔)이 발견되었다. 전체적으로 아름다운 비례와 정제된 조형미를 보여주는 작품으로, 통일신라 후기에 만들어진 것으로 추정된다. 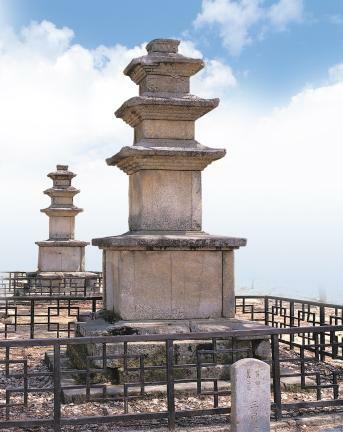 These twin pagodas are situated in the grounds of Chunyang Middle School in Bonghwa-gun, in what is recognized as the original site of Namhwasa Temple. 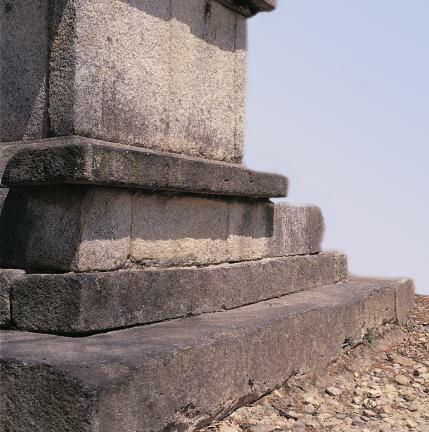 However, the temple was closed after another temple, Gakhwasa Temple, was established 6km northwest by Buddhist Monk Wonhyo in 675 (the 16th year of the reign of King Munmu of the Silla Dynasty). 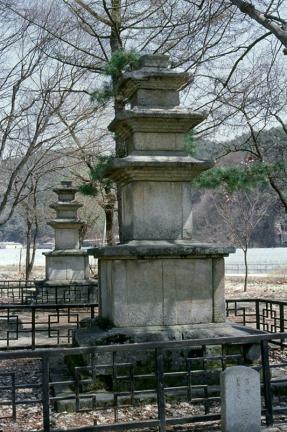 Each of the pagodas consists of a two-tier stylobate and a three-story main body. 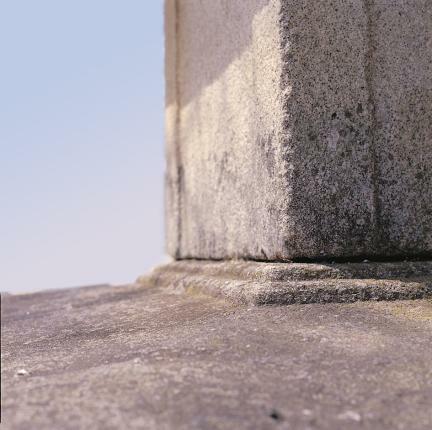 All four sides of the corners and centers of both tiers of the stylobate are engraved with pillar patterns. 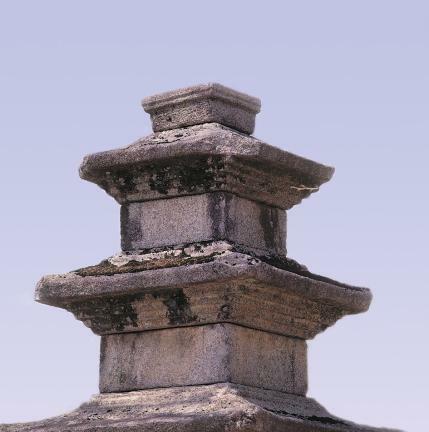 The main body of each pagoda consists of a core stone and roof stone hewn from one stone each, and tapers sharply upwards. All the edges of each core stone are carved with a pillar pattern. The roof stone has a four-tier cornice and curves slightly upward around the four corners of the eaves. 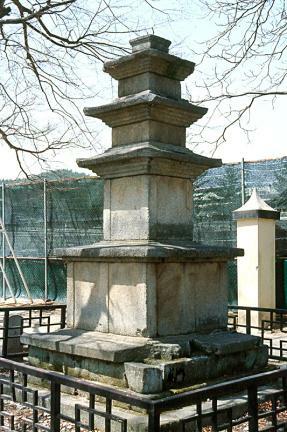 Only the western pagoda still has the base for its finial. The pagodas were restored in 1952 as their stylobates were extremely tilted and lay buried under ground. During the restoration work, a sarira reliquary was discovered in the west pagoda, while a sarira bottle and 99 miniature earthen pagodas were found in the east pagoda. 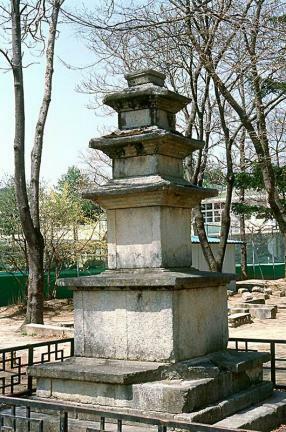 Assumed to have been built in the late Unified Silla Period, the pagodas – though not masterpieces - are well proportioned and display a restrained beauty.